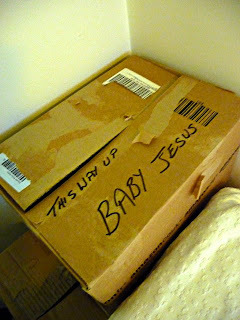 Bishop Alan’s Blog: God in a Box? Vestries often contain lovely things — treasures the public, sadly, never gets to see. In High Wycombe recently, I was very struck by this holy and intriguing object, and couldn't help wondering what manner of cubist Messiah might lie inside. I notice he likes to be a particular way up, too. He’s definitely got more God-in-a-box appeal than average, and could well be the most intresting Hidden Vestry Object in Bucks. I'm not sure which High Wycombe church this was but I do recall one of the churches in that town stored the 3/4 life size nativity scene away and the next year they couldn't find Jesus. Eventually he was located - inside Mary. Let's say it's the one which was once mistaken by News at Ten for a mosque because of its dome. Picture editors at ITN are so well-informed about religion that it didn't strike them that a building with a 9 foot cross on the top probably wasn't a mosque, evem with a green dome. You can't put God in a box! Then you'd have loads of angels worshipping round a box and that would look very silly indeed. Or maybe the angels would go in the box with God. It would have to be quite a big box. Mind you, the bible says that he used to live in a tent. A box is probably less draughty. I thought you'd like that one! I know exactly where you mean. It worries me increasingly the things I _know_ they've got wrong in the press because there are so many I have no idea if they're right or not!! I remember my school visit to the actual mosque in said town. We'd learned all about the muezzin and the call to prayer from the minaret but the one there seemed too small for a person to be inside so I asked "Is the minaret purely decorative?" the answer - "No. It's fibreglass." You most assuredly can put God in a box. He resides in one at S. Barnabas and we bend our knee to it. We call it the tabernacle. We too have boxes like this. Four in fact with different bambinos for the nativity!! God meanwhile has a centre everywhere and a perimeter nowhere, quite hard to get into a box I would have thought. Thanks to all for comment. Even in our culturally less Catholic Bucks landscape, we do have aumbries, and during my time as Bishop I've been delighted to licence two additional churches to have them — part of rediscovering the reality of God at the sacred centre of our life (as opposed to old hassocks and dead flower vases). Not quite the four bambino Church concept (sounds like Egon Ronay), but a modest step in a godly direction, I hope. I wonder if the other characters have their own individual boxes, and whether they mind which way up they are stored. Silly question, probably.